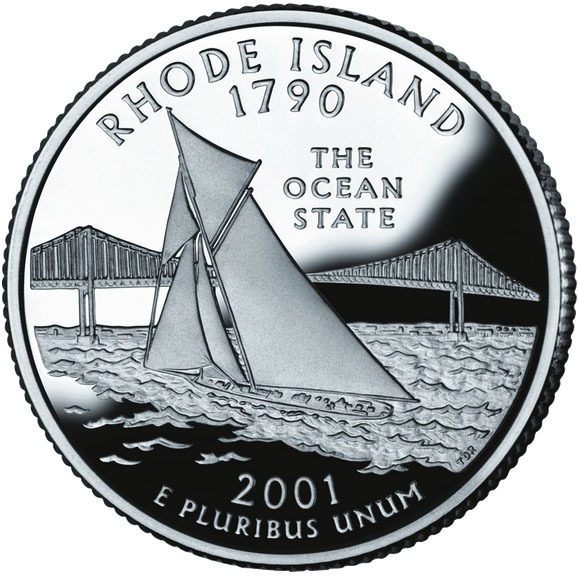 The U.S. Mint's commemorative quarter for Rhode Island features the state's nickname (The Ocean State), America's Cup yacht Reliance on Narragansett Bay, and Pell Bridge. Rhode Island became the 13th state in 1790 (dates of Statehood). Public domain image on Wikipedia. Rhode Island is the smallest state (just 1,045 square miles), but it has direct access to the expansive Atlantic! Alaska is at the other end of the spectrum, covering 570,374 square miles of area. Rhode Island is known for sandy shores and seaside Colonial towns. The state is just 37 miles wide and 48 miles long, but its shoreline runs for 400 miles (includes Narragansett Bay shoreline)! 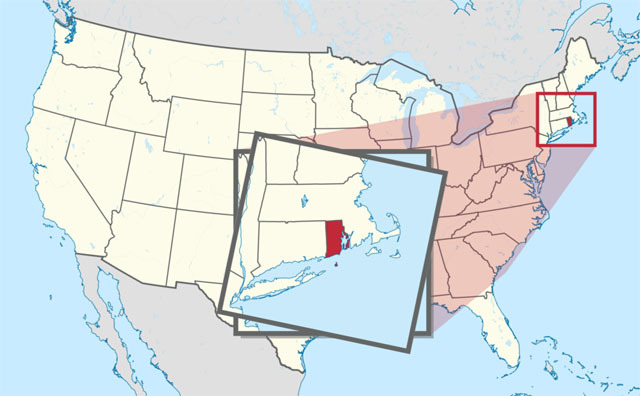 Little Rhody: A traditional nickname for Rhode Island, referring to the state's small size (variations: "Little Rhodie," "L'il Rhody," and "Little Rhode"). The Plantation State: This nickname originates from the state's complete name, "State of Rhode Island and Providence Plantations." The Smallest State: This is another nickname referencing Rhode Island's size. Land of Roger Williams: Roger Williams founded Providence Plantation in 1636. State of Rhode Island USA; image by Concord hioz on Wikipedia (use permitted with attribution / share alike; CC BY-SA 3.0).